Check out what's available on the For Sale pages. We build many kinds of effects units from recycled materials upon request provided I have the parts and you don't mind how they look when I am finished. We also do vintage effect and amp repair upon request. To Contact us just click on the Contact SoaringTortoise tab above. Check out the All New ARTT FOXX Page under the More TAB!! 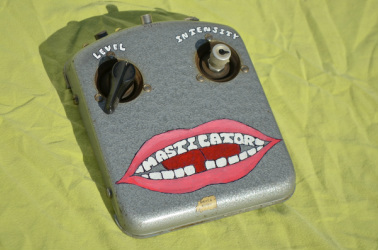 The (High) Contralto sweLL Fuzz Available now! The Baby Tortoise 9-volt Practice Amp! Available Now. Our Latest Spring Reverb. The R"Eve"rb. The COILY GRAIL Spring Reverb Custom Made for Crimson and Clover Studios in Toronto. The ConnMann 30 Watt all-tube Guitar Amp Head. Available Now on the AMPS FOR SALE Page. The Chevron Galaxy V All Tube, True Pitch-Shifting, Stand-Alone Vibrato Unit. Available Now! Electro-Harmonix Small Stone Phase Shifter w/ SoaringTortoise Pedal-less Expressor Eye Mod. Waning Gibbous Phaser with Fuzz and Delay. SoaringTortoise Cigar Box Fuzz. ﻿Germanium Fuzz with Storage! The Fuzz sTone Clay Fuzz. The Admiral Webster 2-Channel 10 Watt Guitar Amp Head. TreMelloween Tremolo Pedal Frighteningly Good Tremolo! Our Fastest Fuzz Yet, 0-100dB in .0032 Seconds. The SoaringTortoise "Tribute To Tremolo" Trem-o-Graph. SoaringTortoise is a Mod(der). Check out our new MODIFIED PEDALS FOR SALE page under the MORE...tab. We are also offering pedal mod services. If you are interested you can contact us through the CONTACT SOARINGTORTOISE tab. Check out our new Review and Customer Feedback and Testimonial and Customer Request Custom Build pages under the MORE... tab. A Custom Customer Custom Order TreeVerb For Our friends in Australia. Check out more pictures on the Customer Request Custom Order section under the MORE tab above. SoaringTortoise AA/G.A.S. Germanium Fuzz: Out for Review at Gearmanndude! SoaringTortoise TV-TV 2-Channel, 14 watt, tube amplifier w/ effects. The Bearded Countenance Clay Fuzz Now Available! SoaringTortoise Ge Power Trio Germanium Transistor 3-Band Booster. TREEVERB Studio Spring Reverb Unit. The Cafe' Bustelo Fuzz is a copy of the Interfax Harmonic Percolator made from 100% recycled materials. SoaringTortoise Electronics offers electric guitar effects and amplifiers made from 100% recycled materials. Artfully handmade and tuned by ear. At SoaringTortoise Electronics we strive to build useful, great sounding, dependable, and interesting electric guitar effects and amplifiers, out of 100% recycled materials. We re-purpose and reorganize components from old worn out, broken, and obsolete electronics items into useful and affordable effects units with handcrafted enclosures made from a variety of recycled materials. Every item we make is one of a kind out of necessity, due to the availability of materials, and what is possible to create out of those materials.